WASHINGTON, D.C. -- President Muhammadu Buhari -- a Muslim from northern Nigeria -- earned widespread approval from the country's Muslims and Christians after his election in 2015. But as Election Day approaches this Saturday, the electorate is deeply divided along religious lines over Buhari's job performance and other key issues. Muslims in Nigeria are almost three times as likely to approve of Buhari (73%) as are Christians (26%). About half of Nigeria's population identifies as Muslim; about half identify with a Christian faith. Since military rule ended in Nigeria in 1999, the country's presidency has typically alternated between a Christian Southerner and a Muslim Northerner. Buhari's predecessor -- Goodluck Jonathan, a Christian from the country's South -- broke that pattern by occupying the office for more than one term. Buhari's election in 2015 was generally perceived as a Muslim's turn to take the post, as well as an opportunity to tackle corruption and defeat the Boko Haram militant group that had seized substantial territory under Jonathan. Buhari was popular with both religious groups when he took office, but his approval has declined since then, amid economic recession, increasing food prices, continued perception of widespread corruption and, recently, a resurgent Boko Haram. The gap in approval for Buhari between the two religious groups has grown and now stands at 47 percentage points. In addition to their differences on approval of Buhari, Muslims and Christians are also divided over other key institutions. Before Buhari's election in 2015, Muslims' and Christians' confidence in the country's government usually differed by fewer than 10 points. After Buhari's election, Muslims' confidence jumped, with more than half (54%) expressing confidence in the national government, up from 26% in 2014. 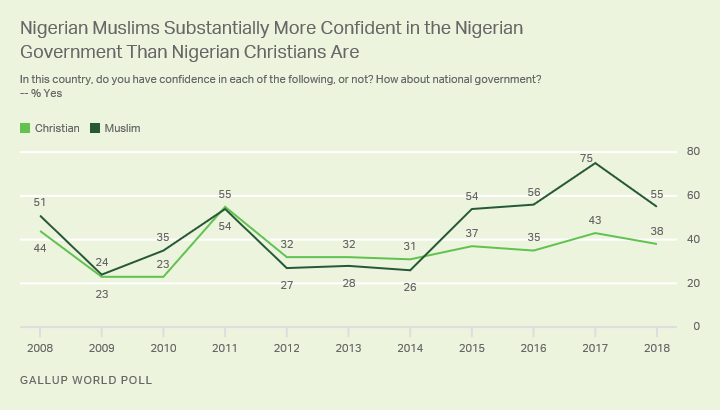 Among Christians, there was a modest uptick to 37% saying they had confidence in the Nigerian government, compared with 31% the year before. Seventeen points currently separate Muslims' and Christians' views of their government. The gap between Christians' and Muslims' confidence in the Nigerian military is even greater. After Buhari's election, confidence in the military jumped 30 points among Muslims to 90% and increased modestly among Christians to 69%. This jump is likely attributable to Buhari's past position as a general in the country's military and his promise to defeat Boko Haram. High levels of confidence in the Nigerian military among the country's Muslim population have persisted through Buhari's term, with no less than 84% of the group saying they had confidence in the armed forces. Among Christians, the modest post-election increase in confidence in the military has fallen over time, with confidence now essentially equivalent to where it was before Buhari's election. Buhari is credited with some success in his effort to tackle Boko Haram, and Nigerians' perceptions of the threat the group poses have faded over time. This should have served to improve confidence in the military among both religious groups since 2015. 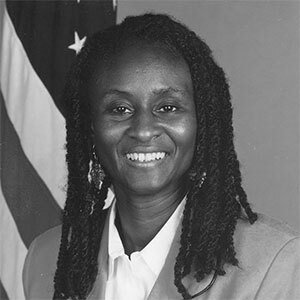 However, at the same time, there have been increased attacks on Nigerian Christian communities, likely contributing to the gap in confidence in the country's military. Nigerian Muslims and Christians are also divided over the honesty of the country's elections. Trust in the honesty of elections jumped among both groups in 2015, with 53% of Muslims and 38% of Christians expressing confidence. But while confidence continued to climb among Muslims -- before falling precipitously in 2018 -- it has dropped and plateaued among the Christian population. 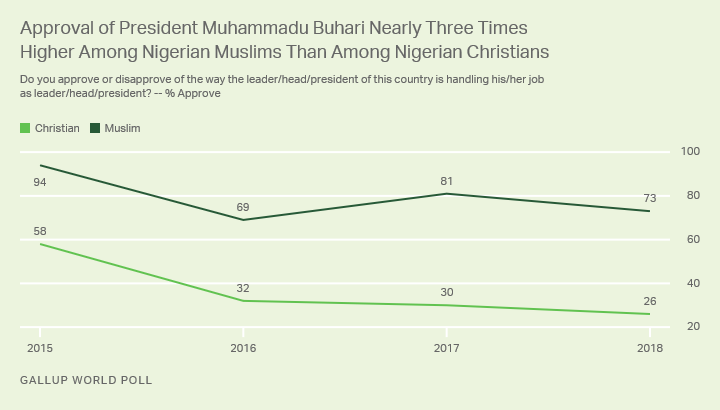 Despite the sharp decline among Muslims, there is still a substantial gap between them and Christians in perceptions that Nigeria's elections are honest. 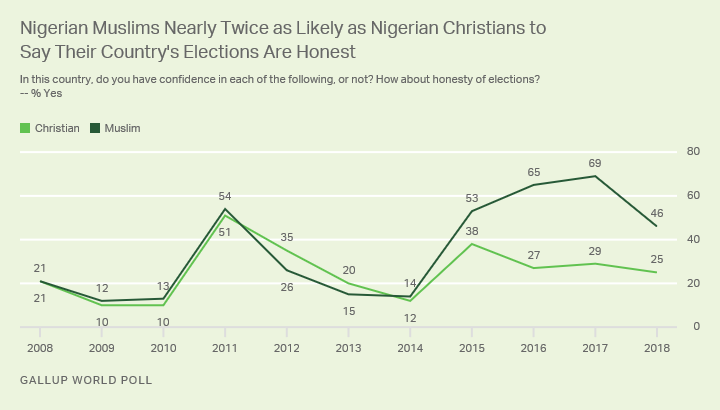 Forty-six percent of Nigerian Muslims and 25% of the country's Christians currently have faith in the honesty of elections. 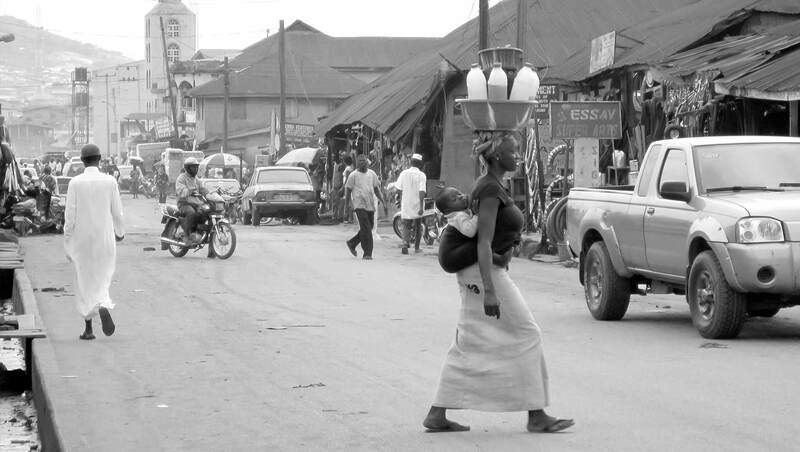 Nigeria is no stranger to religious violence, with an extensive history of conflict that is at least partially attributable to or exacerbated by religious differences. However, these conflicts have been as much about economic and tribal issues as they have about religious issues. Violence between mostly Muslim pastoralists and mostly Christian farmers has been ongoing for nearly two decades. Over the past three years, at least 3,600 Nigerians are estimated to have been killed in related violence. Predominantly Muslim pastoralists are being brought into greater conflict with the largely Christian farmers because of decreasing availability of land suitable for grazing their animals. Nigerian Christians perceive that Nigerian authorities have not adequately investigated or prevented attacks on farmers. These perceived failures may be at least partly responsible for stoking the divides between Nigeria's Christians and Muslims. Should Buhari win a second term as Nigeria's president, the gaps between the perceptions of the two religious groups may only grow, unless the underlying causes are addressed. These gaps suggest a belief among Christians that Buhari has favored Nigeria's Muslims at their expense. This belief, coupled with existing tribal and economic grievances, could lead to increased tensions between the religious groups. Additionally, Buhari's popularity among Nigerian Muslims and their generally more optimistic views of the country's government may ensure him a base of support from which to both perform well in the coming election and potentially govern the country should he win. The economy and security will be two issues on Nigerian voters' minds as they head to the polls this weekend.